This view was part of Streets of America in Disney World that closed in 2016. So no street or satellite pin. San Francisco Hill Facade at Disney World in Orlando Florida. I was there but won't return to everything fake and unsupervised kids gone wild. Maybe I understood by myself, but I do not have a clear response in Orlando. Please: help my solitary neuron understand why they placed it in Florida. 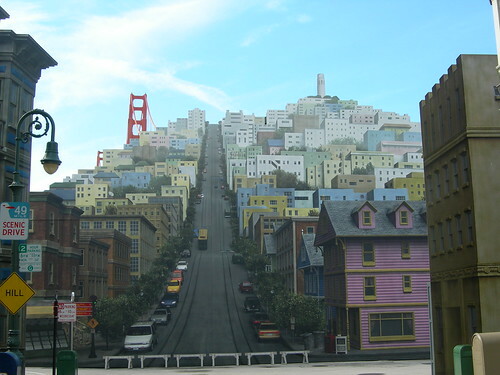 there is no cable car going up Telegraph Hill, and maybe the picture looks so unreal because it is photoshopped. This is San Francisco, California! 100% San Francisco! That's Coit Tower in the background (on the right side).